This font is a freeware. You are free to use it for any personnal or commercial project. You may embed it in pdf documents, web pages or flash animations. You may not modifiy the font files. You may not sell this font or licenses for this font. You may not redistribute or share this font without written permission of Joël Carrouché. This means you may not put the font on your website for download without prior consent. The font files are provided as is, without warranty of any kind. Joël Carrouché is not liable for any damage resulting from the use of the font. If you use this font for something cool, drop me a line ! 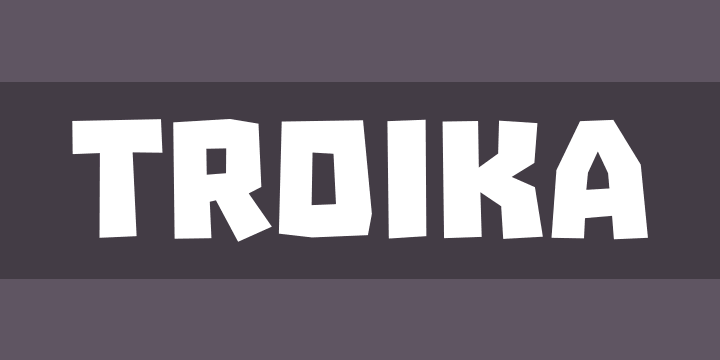 Troika typeface designed by Joël Carrouché. Greek and cyrillic designed by Panagiotis Chatzigeorgiou.